One of the great things about the Hills Market is that you can get Jeni’s ice cream, Pistacia Vera and Pattycake Bakery goodies all under one roof. 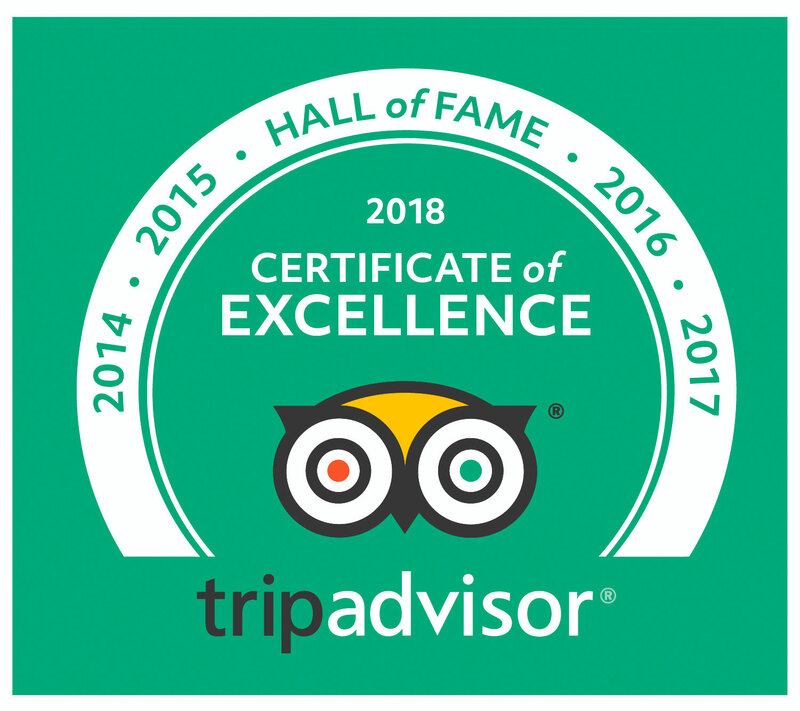 Add that they are licensed to sell liquor and that they have a great cheese selection and you don’t need any more reasons to go. This event was the same formula as the Pistacia Vera tasting I went to in February: delicious desserts, some interesting wine pairings and enough sugar to leave you twitching. 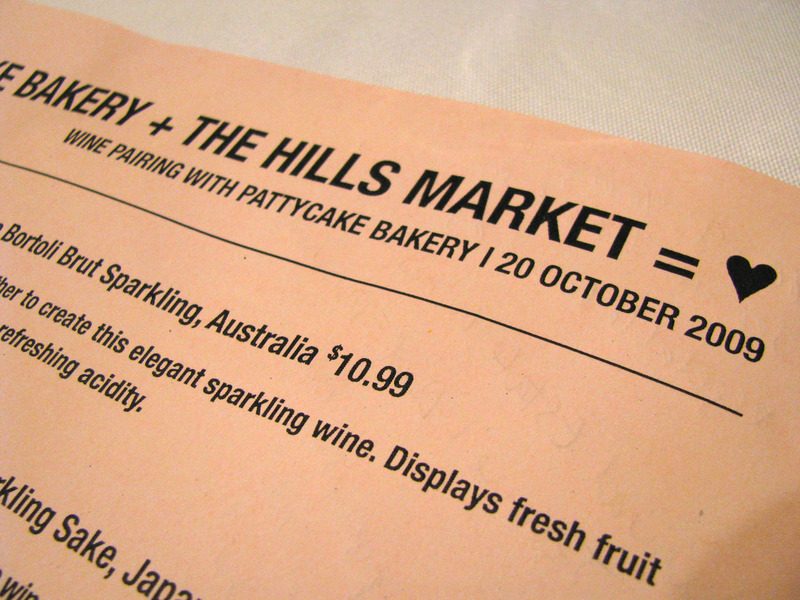 The difference was that Pattycake desserts are all cholesterol free…. make without any dairy or eggs. Jennie Scheinbach the owner of Pattycake Bakery gave an overview of Pattycake Bakery and introduced each dessert with a brief description, playing down their vegan credentials to such a degree that anyone unfamiliar with Pattycake might never have known that everything they were eating was free of animal products. The evening was a family affair as Jennie’s Dad is a wine distributor with Natural State Wines and he collaborated with the Hills wine director Constance Begue on the wine pairings. We started with a pineapple right side up cupcake paired with a very inexpensive Australian sparkling wine (De Bortoli Brut $10.99). The cupcake and bubbly gave a celebratory feel to the event and it seemed like a rendition of ‘happy birthday’ wouldn’t be out of place. As cupcakes go this wasn’t too sweet as most of the sweetness comes from pineapple juice. 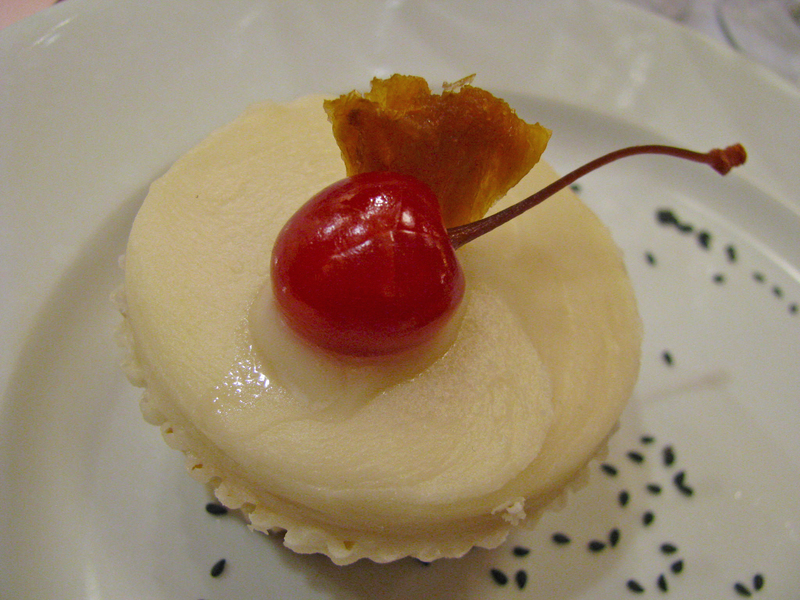 It was topped with a pineapple chip and the proverbial ‘cherry on the cake’. 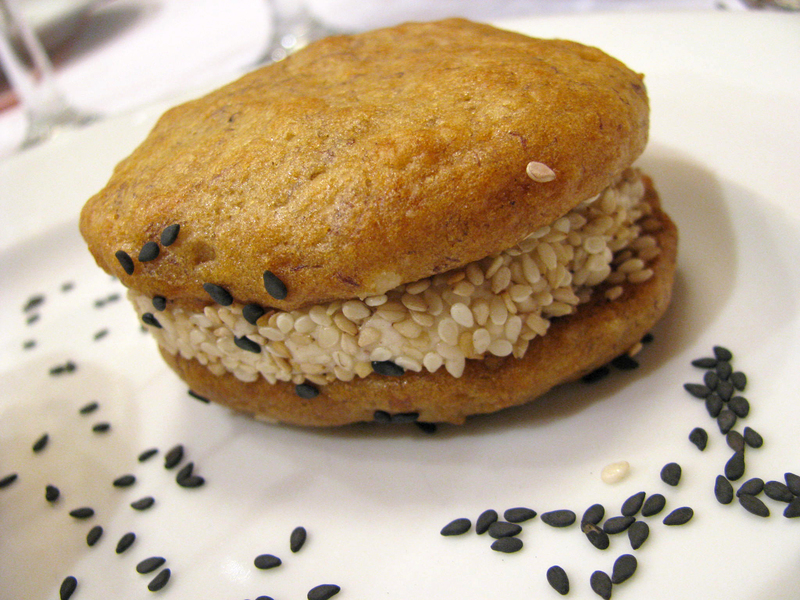 Next was an almond sesame banana whoopie pie paired with more fizz – this time a sparkling sake. The Moon River sparkling sake comes in a bright blue bottle and apparently is the first sparkling sake available in the US. I enjoyed it and thought that it would make a great cocktail ingredient. Whoopie pies are a Pennsylvania Dutch treat and Pattycake make them in a variety of flavors. This one was slightly reminiscent of banana bread with some added texture from the sesame seeds. The next course was one of my favorite pairings. 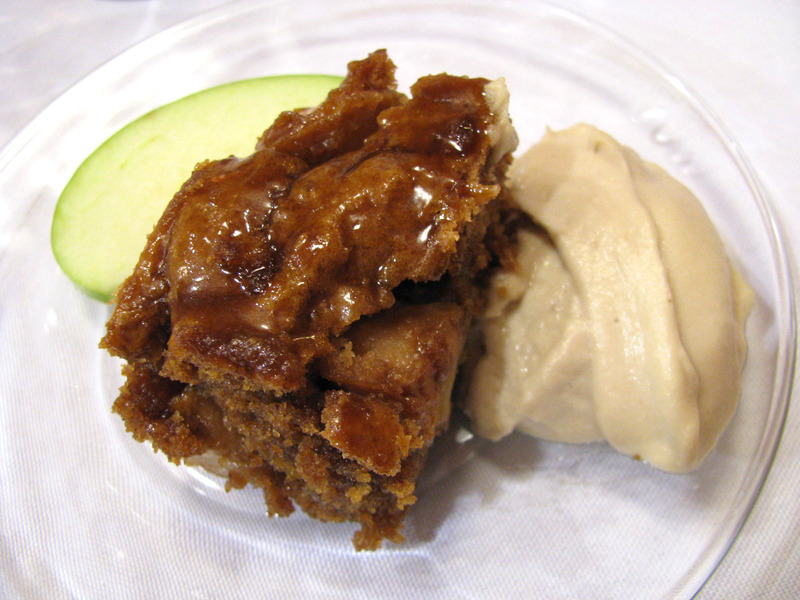 ‘Betty’s Apple Cake’ with cashew coconut whipped cream and a cream sherry to drink. I’m not sure if Jennie explained who Betty is, but the cake was delicious and the cream sherry a great match for the autumnal spices. I think it would be good with other cakes too. I heard someone suggest that the cream looked like hummus, which it did in color. It tasted very different though, light and sweet and nutty and while I wouldn’t forgo real cream, it would be great for both vegans and dairy allergies. By dessert number 4 I was glad I had ridden my bike up to Hills! It was chocolate time – a dessert called XO (hugs and kisses). Most of the desserts we had are only available on special order but XO are regularly on sale at Hills. 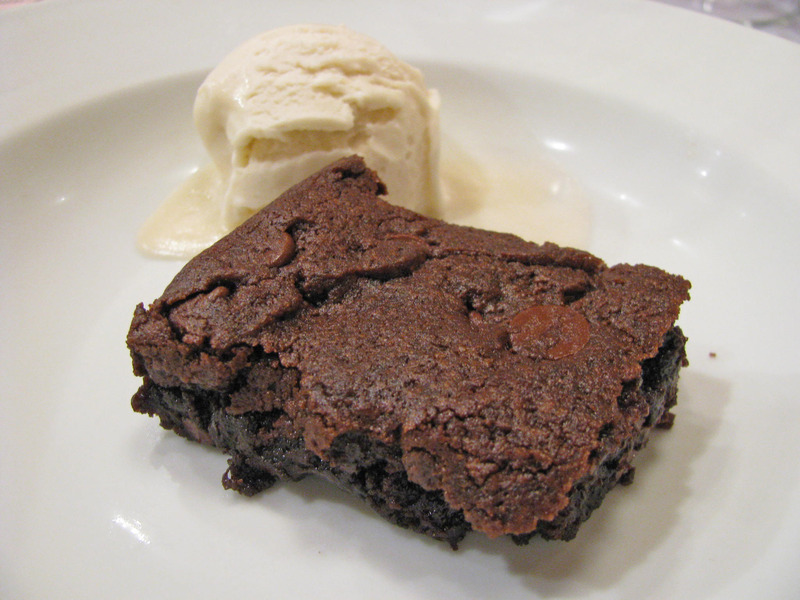 This warm chocolate brownie-like creation was served with a silky smooth soy ice cream and paired with a sparkling Italian red wine (Casali Rosa di Rosa). Sweet but still refreshing it went well with the chocolate and I would certainly have accepted a second glass. Anyone skeptical of vegan desserts could be won over by this one. The final dessert was a sweet potato pie with praline pecan topping and it was accompanied by a vintage character port. This was probably my least favorite sweet of the evening. I think it is hard to make a vegan pastry that can match up to a traditional one. Result: good for vegans – but not for butter lovers. 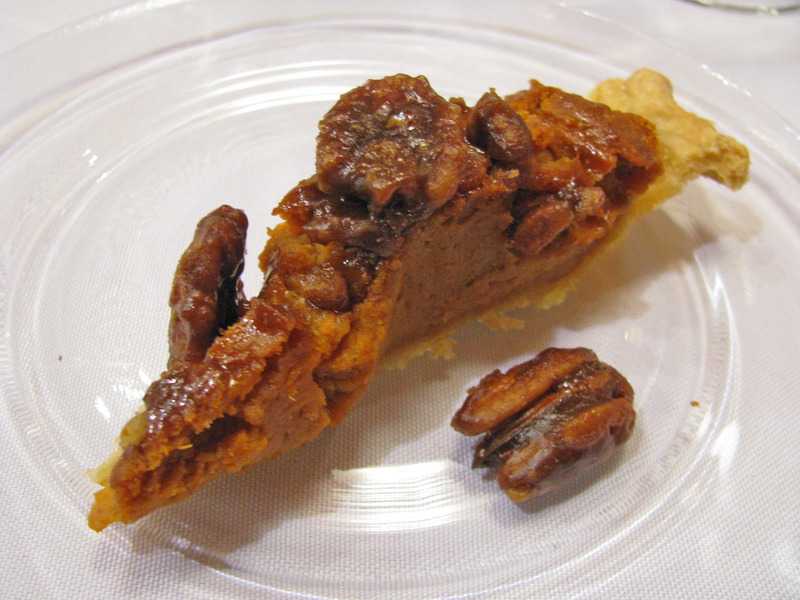 I might steal the pecan praline idea for my pumpkin pie though! Hills have a fun event coming up on November 12th: A dinner featuring the entire Thanksgiving spread from the final issue of Gourmet Magazine, with wine, for only $35. 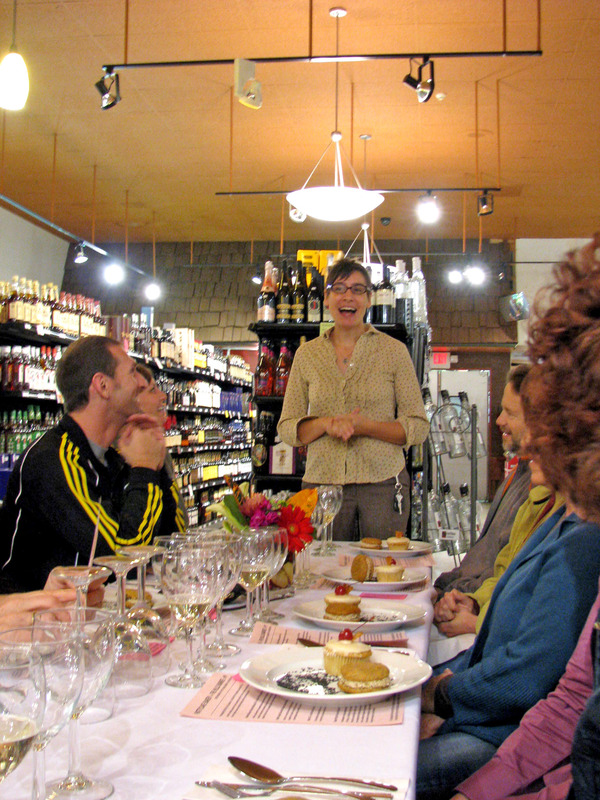 They also have regular wine and cheese tasting and beer tastings. I have been accused by an unnamed person in the retail food industry of being a Pattycake Bakery stalker…I may have found someone to draw the heat away from me. Good post B, you captured the magic of the evening. I will mention that it was an exceptional value at $15.